Valentina Escobar-Gonzalez, MBA, founded Beyond Engagement – Social Media Solutions in January 2012 – and hasn’t slowed down since. She has a passion for assisting small businesses grow their engagement levels with customers online with social media marketing. Valentina keeps up-to-date with the latest marketing, communications and social media trends by networking – not only in the Tri-Cities, but across the state. She joined a panel at the region’s only social media conference in Knoxville, which was attended by 500 marketing professionals and small business owners. 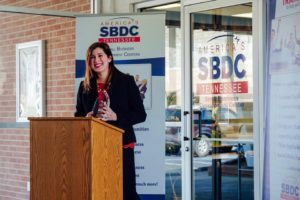 Her topic included strategies for beginning social media marketers, with an emphasis with her experiences with small business owners, nonprofits and educational institutions. Her other achievements include: Named a 40 under Forty recipient in the Tri-Cities (within a year of moving to the area) Received Rising Star Award by America’s Small Business Development Center, SBDC Featured in National Marketing Smarts Podcast: Big Heart, Small Budget: Social Media for Nonprofits and Small Businesses Featured in Speaking Your Brand Podcast, Hosting Local Workshops to Reach Your Ideal Clients Named 70 Rising Social Media Stars Featured in The Business Journal of the Tri-Cities, TN/VA, Valentina Escobar-Gonzalez: The surprisingly social social media consultant She presented to the American Advertising Federation of Coastal Carolinas in Myrtle Beach, Greenville, SC, and SW Virginia and Tri-Cities, TN/VA about the latest Social Media Strategies on Facebook/Instagram. Valentina has participated in numerous speaking engagements to education institutions, including Milligan College, East Tennessee State University, Emory & Henry College, and Northeast State Community College’s Foundation where she helped increased donations through social media and assisted in promoting its inaugural Derby event through Facebook. Get to Know Valentina Originally from sunny Miami, FL Majored in animal sciences, Horse Business Huge Gator Fan Mother to two girls under the age of 5 Board Member of Second Harvest Food Bank of Northeast TN Member of Walk Committee for Alzheimer’s Association, PEAK (Young Professionals of Kingsport), and Membership Chair/Rotarian of Tri Cities Club Want more information? You Can Call Me 855-880-5082 or email at Valentina@Beyond-Engagement.com.